Coco Garden Villas is 5 kms from the heart of Elnido. With garden and coconut plantation inside and around the property, guests can enjoy serenity and fresh air and the splash of water in the creek nearby. 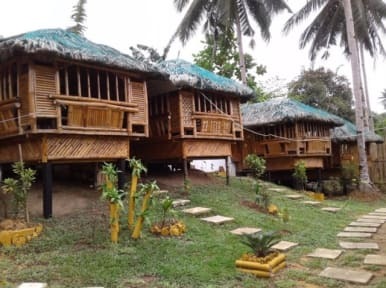 Villas are made of bamboo and nipa roof that makes temperature cool inside without the use of airconditioning avoiding CFC (Chloro Fluoro Carbon). Rooms are fitted with windows offering ample natural lighting, and bathroom facilities are en-suite. Hostel provides free breakfast and free ride to town. This property houses a 24-hour front desk where friendly staff can arrange for water sport activities. 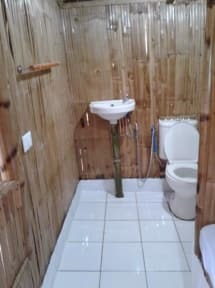 The hostel also offers massage treatments, laundry and ironing services at discounted prices. Coco Garden Villas is only one kilometer or a five-minute drive by scooter from the popular Las Cabanas Beach with its stunning sunset view. Town Proper is a 10-minute drive away while Elnido Airport is a 20-minute drive away. 8. Breakfast included in the price and free ride to town.